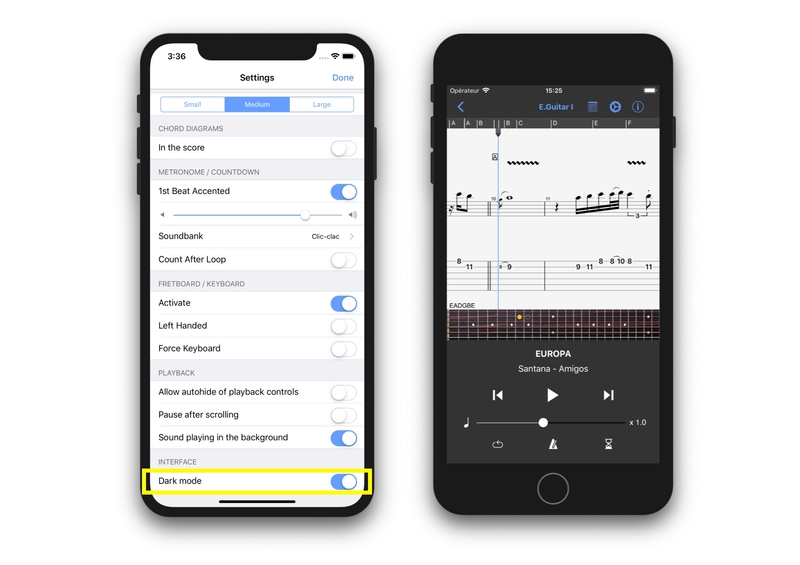 The Guitar Pro application for iOS now integrates the dark mode, which highlights the score and relegates commands and menus to the background. The white color of the application’s background becomes darker to alleviate eye fatigue. To enable or disable the dark mode, click on Settings (sprocket-wheel icon), available in the top right corner of your application when you are reading or editing a score, and then enable or disable dark mode in the Interface section. 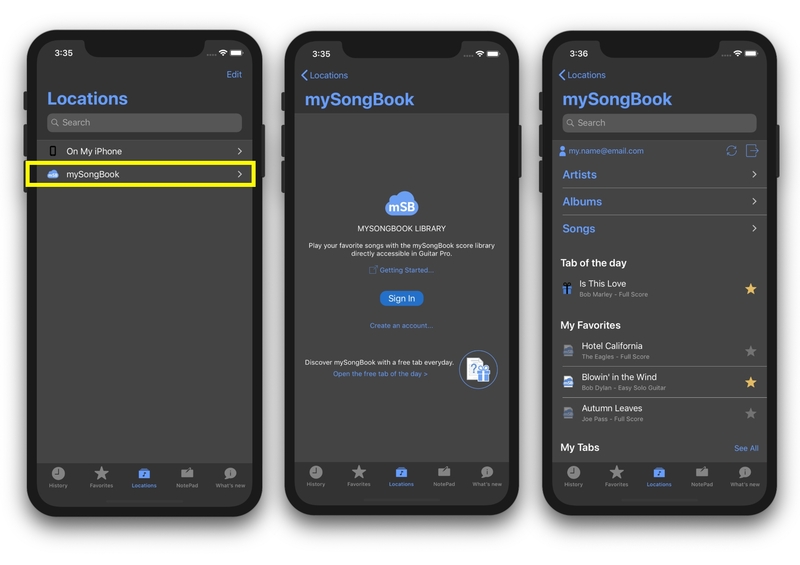 If you use mySongBook, our paid tablature and music-score service, you can now access the entire library from the application with your monthly subscription. Every day, you can also access one score for free and learn a new song. Several ergonomic changes and enhancements have been added to this update. Changes to the score player: the buttons that allow you to play a score, change the tempo, play in a loop and use the metronome or visual countdown have been enlarged for easier use and adapted to the most recent devices. It is also possible to automatically hide those buttons when playing a score in the application Settings. 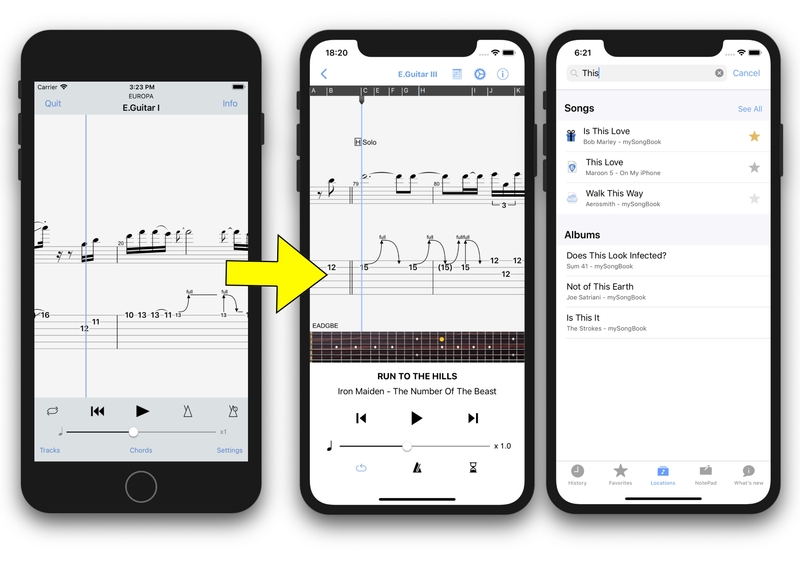 New simplified file browser: all your music scores and tablatures are available in the Locations section for easier access to the files on your device or via mySongBook. Two new info items about the score are now displayed: an icon with the file format used, and the album’s name. More efficient search engine: it searches for files in the phone/tablet and on mySongBook. The search results are displayed according to artists, albums and songs. An update for the Android version will come soon. Download Guitar Pro today from the AppStore or Google Play! Find the Guitar Pro application and tap Update. If asked, enter your Apple ID password. The update will download and install.